Best summer camps 2017? Oh, where do we start? There are so many great choices out there to choose from! We will be covering several categories along the way. We have boys camps, girls camps, Christian camps, ski camps, and all of these camps are just all around fun! Admit it, after your wonderful homeschooler had been locked up with you, making all of those awesome grades, they deserve a get away! We know it’s hard to let go sometimes… We also know that you probably remember the first time you went to summer camp. You still remember all the people and fun you experienced. How can you possibly deny your child that experience? Is the summer camp you are choosing safe for your child? This is a great question that all parents may have. In our research, we discovered that there is an accreditation group called the ACA-American Camp Association. The ACA has a website and a number you can call to check if your camp is a member. The ACA sets standards for a camp to abide by in order to be a member. Some of the standards are safety-first aid training, all the way to food services, and in some states the camps may be required to have background checks on the people who work at the camps. ACA Accreditation means that your child’s camp cares enough to undergo a thorough (up to 300 standards) review of its operation. You can go to the ACA’s website ACA Camps to find out more information, or you can contact ACA directly through their ACA Contact Page. Never hurts to know who you are dealing with when sending your kid off for a couple of weeks! If you are ready to take the leap and allow your child some independence, here are some great camps to choose from. Horse back riding to snow boarding and amusement park tours. We have them all. Let’s DIVE in!! Thrill Coaster Tours… How can we not start with a camp that travels to over 12 amusement parks? Your teen can ride around 100 roller coasters throughout 15 days at the parks listed below. Also with this trip, your teen gets to visit multiple water parks, see baseball games, go white water rafting and jet boating. Seriously, what kid would not want this?! Drug test and criminal background checks are performed on all the staff members, and everyone is CPR – First Aid certified. There is a zero tolerance policy for all of the campers and staff. Staff to camper ratio is 1 counselor for 8 campers. The Thrill Coaster camp is fully insured. Sea Trek Summer Camp at Sea... Love the water? You’re going to love this one! Set in the crystalline waters of the British Virgin Islands, SeaTrek programs offer opportunities for self-discovery and adventure! Hike through rain forests, explore rocky intertidal areas, learn island culture from the locals, play beach volleyball, and even dance during camp beach parties. Trekkers learn SCUBA diving and get to experience kayaks, knee boards, wake boards, and other based adventures. Your teen will learn sailing along with marine biology to go with all these other great excursions! Perfect for your future marine biologist! All of the staff at SeaTrek are trained professionals and have been in this line of work for a long time. You can see all of the great staff and their information on this link. SeaTrek Staff. High Cascade… Oh summer is so so hot! Wouldn’t snow be wonderful? Well we have the spot for you! How would you like access to two private snow board parks for summer camp? It is real! All you have to do is sign up for an all-inclusive, 8-day summer snowboard camp located in Mt. Hood, Oregon. High Cascade is a ski camp where you have access to two private snow board parks, 72,000 sq. ft. skate board park, along with lessons and 24 hour supervision. Youth ages 13-17 are provided airport shuttle, lift tickets, food, lodging, and lots of free stuff! Here are some of the great lessons you will learn. Campers are divided into coaching groups according to ability first, age second, and placed with the most suitable male or female coach. There are several sessions and dates available with prices starting at $1,749. Dates and Prices Link. Camp Lohikan… Oh my goodness, I want to go to this one myself! Camp Lohikan in Lake Como, Pennsylvania has all kinds of cool stuff going on! You can choose Survival Camp!!! How cool is that? Survival Camp is a three day program full of hands on lessons, survival games, and overnight field trips with wilderness specialists. You will be able to learn how to stay warm, what to drink and eat, how to make fire with no matches, signaling for help, finding your way out of the woods, along with how to navigate using the moon and stars. This is honestly stuff everyone should know! This is not even close to all this camp has to offer! This camp goes above and beyond. Go to this link and have a look. Camp Lohikan Website. Camp Lohikan’s has 5-6 registered nurses and a Health Service Manager. The health center includes an examination room, male and female dorm rooms, and living quarters for all of their medical staff, not to mention, is open 24 hours a day. The camp dates start around June 25th through Augest 18th and prices range from $900 to $9,200 depending on length of stay. Camp Tuition & Sessions. The Kids Culinary Academy of Florida, I am sending my kids to this one! Maybe, just maybe, my kids will cook for me someday and not just eat everything in the house! …Well, one can hope! Kid’s Culinary Academy of Florida is a summer cooking camp offering one, two or multiple week sessions where kids learn a variety of cooking skills. Kids Culinary Academy is located in Cocoa Beach on Florida’s Space Coast. Nearby is Ron Jon’s, Fresh Seafood Market, a local Pizzeria and boating on the Banana River Lagoon are just a few added features to their cooking camp experience. Who doesn’t love Florida and food? Kids Culinary Academy is also currently planning a new “Kids Cooking Reality Show” to happen around June and July 2017. The Kid’s Culinary Academy of Florida offers FREE pick up at area airports. Melbourne International Airport. or Orlando International Airport. Your child will meet their Chef Instructors and Culinary Camp counselors and are then transported with their assigned camp counselor to their hotel accommodations at a Oceanfront Hotel Resort. 2017 summer camp dates start around June 12th. You can see all the dates available and more by clicking this link. 2017 Summer camp dates. Heritage Park… Wow! Another really cool place! Heritage Park is located in Calgary, Canada and if your student loves history and has a great imagination, they will love this five day program! The Home on the Range Overnight Camp only cost around $535 dollars plus a $50 dollar costume rental. This is a really affordable camp experience that your student will remember forever! Campers will live the lifestyles and perform the activities of settlers and ranchers at the turn-of-the-century as they spend the week at Heritage Park. Each day, you may be called to help with chores at the ranch, learn to become a teamster or apprentice in a trade. Once the work is done, they might listen to traditional Blackfoot stories or a play in the Canmore Opera House, maybe even take part in a barn dance. Campers will get to stay in a bunk house that is a restored barn, home of the Talisman Heritage Education Center. Summer Explosives Camp… Oh my goodness! You better ask dad about this one! “Dad, you think you can talk mom into me going to a camp where I can blow stuff up? Please!!! !” ….If you manage to get a yes on that question, we have found a camp for you….. How does Explosives Engineering Summer Camp sound, kiddos? 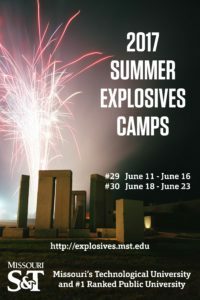 Missouri S&T runs this first of its kind camp where high school students have the opportunity to gain hands on experience with explosives. I mean, who doesn’t love to blow stuff up? The camp is set up with a variety of lectures, demonstrations, handling and shooting of explosives, field trips, projects where you can take part in the setup and shooting of a fireworks display. It encompasses detonators, high explosives, blasting agents, rock blasting, display fireworks and demolition. Students obtain a behind-the-scenes look at how explosives are used in industry and entertainment. Students pursuing a career in the explosives field will get this great opportunity to learn great skills required for the profession. Sorry, minimum age for this camp is 16 and anyone over 18 has to submit a background check, along with being screened to ensure good moral character. Camps start this year on June 11th. These are just some of the courses offered through this camp, if you want to see more click on this Course Link. US law prohibits certain individuals from handling explosives. Before you continue, please ascertain whether you are eligible or prohibited under their eligibility page. We could not find the cost of the summer camp. Here is the contact info to call, if interested. 1201 N. State St., Rolla, MO 65409 | 573-341-4111 | 800-522-0938. 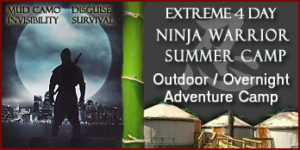 You can see more information about this exciting camp at this Ninja Camp Link. We did not see the cost of the camp, but here is the contact information needed if you are interested in finding out more. 845-386-5425, ninja@ninjacampusa.com. These are just some of the great training courses available with this camp. We could not find the prices or start dates, but if you would like to learn more, you can contact the camp directly with the information listed below. American Parkour… You ever feel like telling your teen, “Go jump off a building?” I know… a little harsh, but, if so, we have the perfect camp for you! American Parkour Summer Camp is a five day interactive and high energy experience that provides your child with parkour training. Campers will find their ability to jump, climb, vault, roll and more in the parkour gym, then take their skills out to local parkour hotspots all under the full supervision of experienced and certified instructors. How cool is that? Camp runs Monday through Friday from 9 AM to 4 PM. Three summer camp sessions for 2 age groups are offered. The minimum is 5 students per session with a maximum of 15. This camp is based out of Washington DC and starts at around $449 dollars. You can see more about this exciting camp at this link. AMERICAN PARKOUR LINK.